Lancashire security specialists, Keyways can provide your business with the very best security system designed to suit your individual requirements. In the past entering and leaving a building whether it be a school, hospital or hotel was something based on good faith and trust. However nowadays, working on this basis is no longer viable and there is a great need for entrances and exits to be protected and made secure. A simple yet very effective means of making floors and entrance with a lack of security made secure, is an access control system. We offer and provide a wide range of access control technologies that can be tailored and suited to your individual requirements. The traditional access control system is still a lock operated by a key or multiple locks and a master key system. Keys can be protected from duplication buys using very intricate key designs and copyright that is protected by law. This type of access control has been installed at schools, offices and large houses in the past by Keyways throughout the Lancashire area. 1) In the case of a lost key - It is not possible to remove just one key from the system, all of the locks would need to be rekeyed. Digital locks can also be a good solution for you access control and are an cost effective solution. However digital locks also unfortunately cannot provide an audit trail. It is very easy to change the access code but is more difficult to make all the code users award of any changes. For this reason digital locks are normally only used as an access control solution for companies that are at low security risk, with a limited number of users. We can provide you with advice and information on access control solutions for higher security application with large numbers of users. 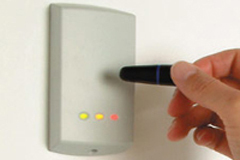 Electronic access control system for this type of application should be considered. Contact us for more information on how we can help protect you business through the use of access control. We operate throughout the Lancashire area.